This is for those who have already registered for BVN in another bank and wish to link it to your GTBank account without having to visit any of GTBank branches. 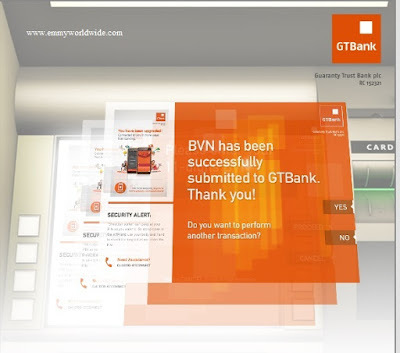 To link your BVN to your GTBank Account through any ATMs nationwide is quite easy and possible. Here's how to link your BVN to your GTBank Account via any of our ATMs nationwide. Reasons Why you Should Register for BVN. So how can I Link My BVN Details to My GTBank Account through ATMs?? 7. Your BVN is automatically linked to your GTBank account. That all…. You are good to go! You can also link your Bank Verification Number details to your GTBank account through Internet Banking platform or visit the BVN linking portal on GTBank website to complete your request. To do that is quite easy and possible. Read : How to Link Your BVN Details to Your GTBank Account via Internet Banking or BVN linking portal on GTBank website. Inline with CBN directive, the final deadline for registration is October 31st. know that without your BVN, your online/mobile transactions will be restricted and you will also have limited access to loans. If you are yet to enroll/register hurry and to register for your BVN now! Already registered your Bank Verification Number details from any Nigerian bank and you have misplaced the number, due to one thing or the other, you have nothing to worry about. Read how to Check Your Bank Verification Number(BVN) with Your Mobile Phone, any type of phone and any network.